Update, February 15: They’ve made it official – here’s what to expect from Lion and Finka. Ubisoft have unveiled the two new operators heading to Rainbow Six Siege, detailing the backstories and loadouts for Operation Chimera’s new additions. 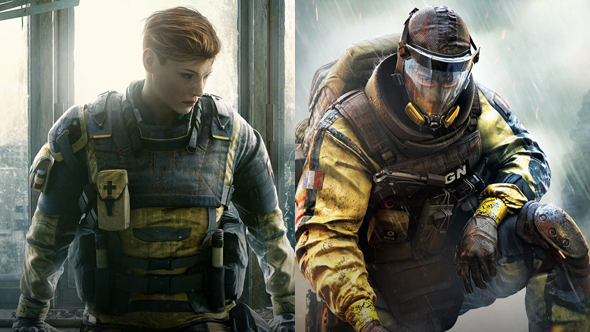 As we’ve known for some time, Lion and Finka are both biohazard specialists who should be well-suited to the infection spreading in the upcoming Outbreak event. Here’s everything we know about Rainbow Six Siege Operation Chimera. Finka’s gadget delivers a nanobot healing agent to give fellow operators “a short boost of health to get them back on their feet, to give them an extra push, and to steady their aim.” Lion’s gadget is the EE-One-D drone, which detects enemy movement in an area. This all checks out with last week’s leaks, so you should probably expect those usage and cooldown details – which you can see below – to remain accurate. Both operators are listed as attackers with medium speed and armor. If you’re interested in a little more lore with your loadouts, you can check out extensive bios for Lion and Finka at Ubisoft’s official site. Expect more details on the operators, Operation Chimera, and Outbreak as the Six Invitational proceeds this weekend. Update, February 13:A recent leak for Rainbow Six Siege just got a big boost in veracity thanks to the Six Invitational stream. Last week, a set of leaks started circulating on 4chan, purporting to reveal the details of the gadgets and weapons for the upcoming Operation Chimera operators, Lion and Finka, along with some bits key art. Now one of those pieces of art has shown up in the official graphics for the Six Invitational stream, suggesting that the leak has a pretty strong foundation. Based on the info, Lion’s special ability will be the “EE-ONE-D” drone, and Ubisoft have already strongly suggested a drone would be part of the arsenal. The ability would launch a pulse revealing the location if any enemy in motion, even through walls. It would have three uses lasting for ten seconds each. 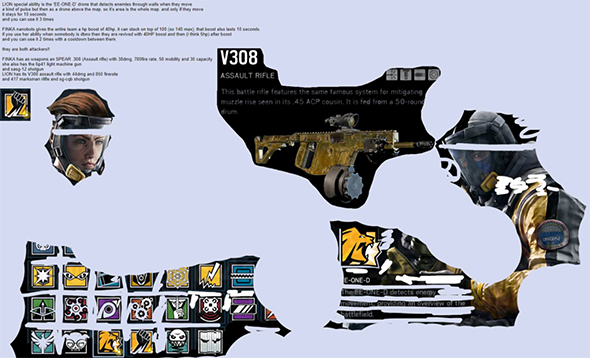 Lion is supposed to be equipped with a V308 assault rifle rated at 44 damage and 850 fire rate, backed up with a 417 marksman rifle and SG-CQB shotgun. Finka’s nanobots – again, hinted at by Ubisoft – are supposed to give the entire team a 40 point HP boost, stackable on top of 100. The boost lasts ten seconds, and can revive down-but-not-out teammates to 40 HP, going down to 5 HP after the boost’s duration is up. The ability has two uses, with a cooldown between them. The main weapon for Finka is listed as a SPEAR .308 assault rifle, rated at 38 damage, 780 fire rate, 50 mobility, and 30 capacity. She’s backed up with 6P41 LMG and a SASG-112 shotgun. Both operators are listed as attackers. Update, February 1:Ubisoft have let slip the names of the two new operators coming in Operation Chimera. It’s not clear whether or not the announcement is intentional, but aUbisoft blog postrunning down today’s news about theOutbreak eventhas revealed the names of Operation Chimera’s new operators. Lion is our French operator, while Finka is the Russian representative. Both will be available when Operation Chimera launches on March 6, and will naturally be playable in Outbreak. Original story, January 30: Rainbow Six Siege’s Operation Chimera is set to be fully unveiled in February, but Ubisoft are starting to get a little more specific about what’s coming in the update. We knew the two new operators will hail from Russia and France, and would be biohazard specialists, likely to tie into the Outbreak event. Now we’ve got a little more detail on what that means. The Russian operator uses “self-dissolving nanobots” for a “range of applications,” and it seems they’ll be able to apply benefits to allies based on the research mentioned in their backstory. Both operators hail from Six’s CBRN unit, and will be joining both the multiplayer roster and the Outbreak event, which will have you pick a team of three to neutralize the as-yet-unconfirmed threat. You can get a teasing glimpse of the new operators in the image Ubisoft have provided above. More details about Operation Chimera, its contents, and Outbreak is expected to be unveiled at the Six Invitational in February.